In the beginning there was art for God’s sake, then in the Renaissance there was art for man’s sake. Beginning with Impressionism there was art for art’s sake. Now, unfortunately, we have no art, for God’s sake! 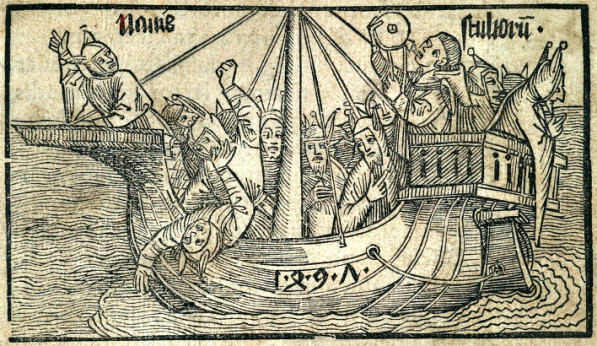 Frontispiece to Sebastian Brant's, Ship of Fools 1494. Yesterday’s post reminded me of these pendants from the book, Renaissance Jewellery by Yvonne Hackenbroch. I suppose these may look garish to the eye accustomed to clean, cold jewelry designs. Nothing cold about these little vessels. Don’t they beckon for a closer look? Gondola pendant, c. 1570, attributed to Giovanni Battista Scolari.